Floating down the river in north Georgia is another one of my favorite summertime activities. Our cabins are located on two great rivers – the Coosawattee River and Mountaintown Creek. You can rent a tube from one of the local companies which will drive you to a put in spot, then come pick you up and drive you back to your car. If you want to go slow, get the tube. If you want to get some exercise, rent the kayak. I recommend everyone in your party to do the same thing, if not there will be a lot of waiting around for the tubers to catch up. If you have your own equipment like kayaks or tubes, many of these companies will just charge you a shuttle service fee for a ride back to your car. Located at the intersection of Hwy. 382 and Eagle Mountain Drive (adjacent to the Eagle Mountain entrance of Coosawattee River Resort) in Ellijay. If you use these guys, you’ll float right by The Twins. For $20.00 per person, they furnish you a tube, a life vest, and shuttle service to and from the river. They also offer changing rooms. Tubing trips run daily during the season, and group rates are available. Keep in mind that children must be at least 48 inches tall. 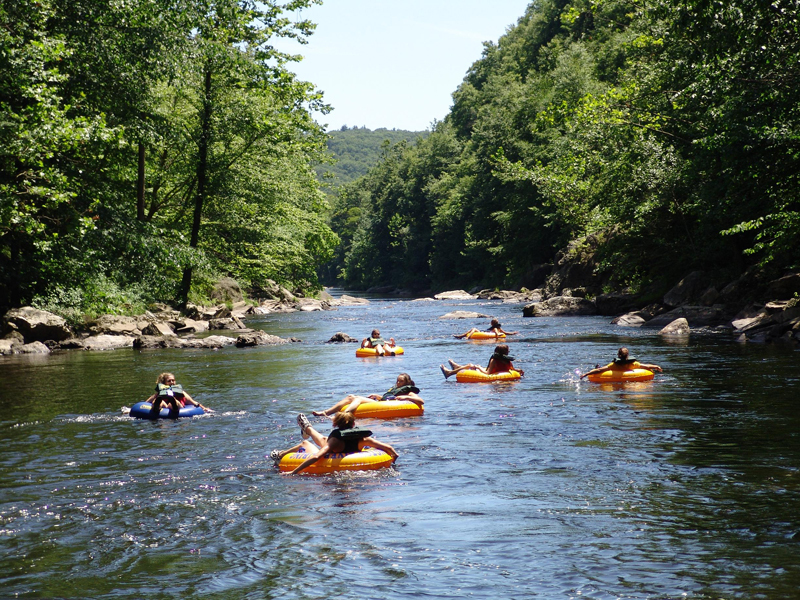 This is the place to be in the Blue Ridge Mountains of Georgia for family fun on the river! The beautiful waters of the Ellijay River run through the mountains in and around the city of Ellijay, merging with the Cartecay River to form Coosawattee. Kids and adults alike will enjoy a tube or kayak trip down the river. These guys do a great job and offer an easy trip down the Cartecay River. Make sure to enjoy the sliding rock at the end of the run before exiting at the bridge. They encourage you to bring coolers and lunch. Just remember- NO GLASS ON THE RIVER! Make sure to stay at one of our beautiful waterfront cabins and have fun experiencing the river from your tube or kayak. You will be close to many rivers such as the Cartecay, Mountaintown Creek, Ellijay, and the Coosawattee. Please enjoy some homegrown music about the the north GA river from my good friend Thomas Fountain!